Northcott Silk Inc. sponsors the War of 1812 story quilts!! Northcott Silk Inc. has donated bolts and bolts of fabric for the two War of 1812 story quilts. Northcott is an International Distributor and Converter of fine cotton printed fabrics for the quilt, craft and home decor industries. Founded in 1935, Northcott was originally a fashion textile converter. During the mid ’80s they shifted focus to the cotton print market. Their cotton prints are in retail stores and quilt shops around the world. Sixty blocks have been designed. One by one they are being pieced together by quilters throughout the area. Joan Hillhorst, at Sew Creative, quilt coordinator, is looking for a quilting group to stitch the quilt. 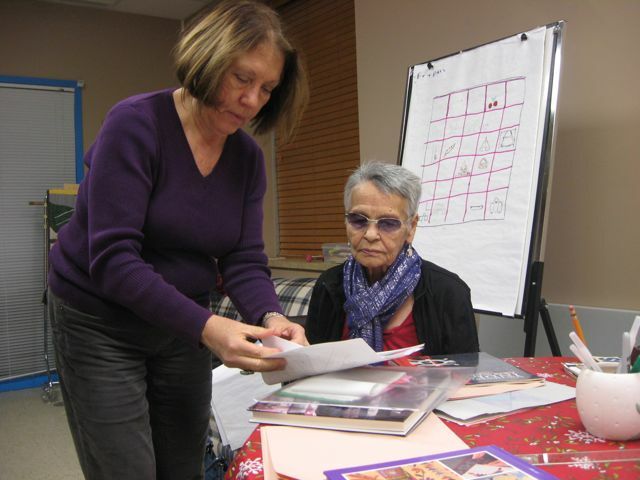 Shirley Baker and Freda Henry plan story quilt. Posted on March 15, 2012, in Barn Quilt Champions., Quilt block patterns., What's the impact?. Bookmark the permalink. Leave a comment.